Carmen Jorda tweeted an article yesterday claiming "F1 is a mans world, you have to fight to progress." The irony being that if she was a man she wouldn't be anywhere near a GP3 seat, let alone F1. How can anybody be so non self aware! I think she's probably very self aware, but she can hardly come out and say "Of course i only got the GP3 and Lotus link because I'm an attractive model". In which case she would not say "F1 is a mans world, you have to fight to progress". She would have just said something else in the interview. Why would she say something else? When talking about how hard it can be for a female racing driver, what she said makes perfect sense for her to say and, if anything, proves her self awareness even further. "F1 is male dominated, but I'm fighting the good fight" etc etc. So is she saying that in a non-men world, women dont fight to progress? 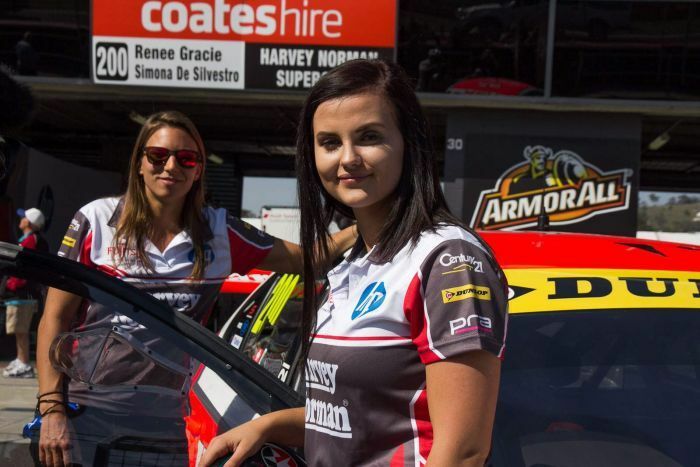 Renee Gracie & Simona De Silvestro first all female team to race at Bathurst for the first time in 20 years this weekend. It's both their first time racing on this circuit and first time De Silvestro has driven a V8 Supercar. There's also been a little bit of controversy as another driver refereed to the team as the "P***y Wagon" during an interview. He has been fined $25,000 and has issued a public apology. Great news on the one hand, depressing on the other. I've been a fan of Simona's for ages and hope the other lady is a decent driver so that they can combine for a good showing. The other guy just needs to be smarter than that. Even if he is t enlightened enough to see the world around him changing he should know to keep that sort of stuff to when he's sitting around yucking up with similarly emotionally stilted friends. Awesome. I'm glad Simona is getting a seat. I've seen Renee race in the early stage of her career in Porsche's, she's ok nothing too special but like I said that was the early stage of her career. As for Reynolds and his remark it was meant to be tongue in cheek as apparently he gets on quite well with Renee but he went a bit far and the officials clamped down on it pretty hard. There have been some "older" paddock members that have been doing some more "Politically Correct" criticizing and I guess the organizers wanted to put an end to it with fining Reynolds as an example. That's my take on it anyway. Visser to Formula V8 3.5 (here) for 2016. Thanks, I'll keep an eye on her progress. I notice the F4 grid has a few female drivers this year, I'll add them. Sophia Flörsch is to me (by far) the most promising female driver currently making her way up the ladder. Yes, she's only 10th in F4 right now, but a) that's not too bad out of 38, and b) she's a lot younger and less experienced than anyone else in that series. I'm optimistic she has what it takes to make it all the way, although of course we'll have to wait no less than 3 years to find out no matter how good she turns out to be. Visser a respectable 11th out of 15 in the Renault 3.5 table after 4 rounds. Interestingly, she is competing against the offspring of Panis, Fittipaldi, Nissany, Cecotto and Deletraz. Calderon was solid if unspectacular in the first GP3 outing. 14th and 18th, which wont really grab the attention of GP2 or F1 but at least isn't an embarrassment like Jorda. her last lap at Oscherslebe sans rear wing was spectacular! Updated first page for a few drivers. Out of all the drivers who completed the full season in Fe, Simona finished last I'm afraid. Indeed.No idea now relatively competitive the teams are in FE, but definitely not the result to get her single-seat career back on track. The chassis are all near enough identical with differing performance from the drive train. Team mate Frinjs was 12th, scored one podium and finished with 45 points to Simona's 4. A point for Calderon today, having started last. Is she of the bjj Gracie family? I thought the same, to be honest, but she's an Aussie. Calderon to Sauber! Didn't spot that one coming. But I can well see why teams do it - Carmen Jorda was all over the place doing PR for Lotus. It only takes them to catch the attention of a sponsor or two to make a difference to a team like Sauber that is struggling financially. It's a pretty simple answer if you look at it objectively. In 2016, she was a 23-year-old rookie in GP3 and managed a best result of 10th (twice), ending the season with two points. Perhaps it was the car? Well her two team-mates at Arden finished 4th and 5th in the standings, collecting three wins and 13 podium appearances between them. Before that she had three years in F3, the best of which was 2014 where she scored 29 points. However, in 2015 she was again completely outclassed by her team-mates, both of whom were rookies. They scored 203 and 65.5 points respectively whilst she failed to score a single point, despite having two years more experience than both. It's good to see another female driver become associated with an F1 team but let's be honest, while she's achieved more than Carmen Jorda did, her career until now has done nothing to justify receiving this opportunity. It's frustrating - to see a female driver to reach a point so many drivers aspire to, but having achieved so little to justify it. But as was clear even with Susie Wolff, the role is not one of third/reserve race driver so where's the harm. As much as I do agree, there is one positive to it. While people like us can look at her career to this date and decide that she's not done anywhere near enough to have earned that chance on talent alone, would a seven-year-old girl watching F1 because her dad watches it see that? She would simply see a female driver as part of an F1 team, and perhaps that inspires someone that age to want to try go karting. Maybe that is what helps actually inspire a female driver who, ten years from now, gets into F1 because of talent and results. But as was clear even with Susie Wolff, the role is not one of third/reserve race driver so where's the harm. No harm. Just a bit of a farce, rightly pointed out. It denies the same opportunity to somebody who has actually earned it? An opportunity to participate in PR - let's face it - whatever has been said in Press Releases about this appointment, we all know this is not a reserve role. She will never be seen in a real F1 session. I'd imagine that anyone with realistic aspirations of driving in F1 - Male or Female - will not be looking for this type of role. I'm not sure it does more good than harm though to have women put in token roles when they are not even close talent wise. If it happens to often could it not start a stereotype of women being slow? Or even possibly create a level of resentment towards female drivers that these opportunity's are given to women who are not good enough? Leah Pritchett won this weekend in the NHRA Top Fuel class. She has now won the first two events of the season, which hasn't happened in the Top Fuel class in 20 years! She beat another woman, Brittany Force, in the final on Sunday. I've always somewhat wondered why so many more women are competitive in drag racing than any other field of motorsport. Certainly despite the G-forces those things are generating they don't seem to have any troubles physically. Yes I think they should at least demonstrate some high-level talent. Otherwise, as you say, people are going to look at them as tokens and other, perhaps more talented female drivers coming up behind will have the weight of even more prejudice behind them. Understand why struggling teams do it. But I think it's appalling sexism, all the same. If the only reason a driver is there is because of their gender that's just plain wrong IMO.